Today I have more reviews to share of books I've read for the Picture Book Reading Challenge hosted by Becky's Book Reviews. 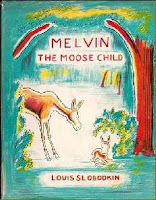 I'm sharing my choices for the following items on the checklist: #8 a book with animals (Melvin the Moose Child), #26 out of print (Everything Under a Mushroom), and #45 a book published in the 1960s (Our Flag). Melvin is a young moose who doesn't have any other moose children to play with. On a journey away from home to find some moose friends, he instead meets a host of other woodland animals, all of whom decide to join him on his quest. When the band of animals encounter something frightening in the woods, however, they decide they would rather be at home after all. Conceptually, this book is a lot like other cumulative stories, but the endearing illustrations make it different enough to be appealing. We have been teaching Miss Muffet about the four directions, so I appreciated the text's reinforcement of the concepts of north and south. I also like that Slobodkin introduces different animals, such as the moose, instead of reiterating the usual litany of farm animals. The story's "there's no place like home" message may be a cliche, but this book makes it feel new and interesting, rather than cloying. This book is similar to Krauss's A Hole is to Dig, Open House for Butterflies, A Very Special House, and I'll Be You and You Be Me, except Maurice Sendak is not the illustrator. 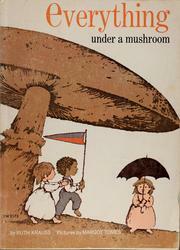 Each two-page spread shows a large mushroom, with a pair of rhyming phrases printed above it. Then, beneath the mushroom, children are shown participating in various activities and having little conversations with each other. The little quotes from the kids are not as memorable as in some of the other books, and the illustrations don't have quite as much personality as Sendak's, but this was still enjoyable. The highlight for me was a little snippet near the end of the book where a little girl tells of a girl at a party who was very beautiful. She describes her beauty and then states, "but the other girls at the party didn't care because they all had warm bathrobes." 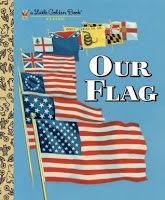 I checked out the ebook edition of this book from the library because of Miss Muffet's recent interest in flags and geography. It's a bit difficult to read it with her on a screen so we may need to track down a hard copy at some point, but it covers everything I would want in a basic book about the U.S. flag. Memling covers the history behind the stars and stripes of the flag, as well as information about the national anthem, and the words to the pledge of allegiance. There are also historical details about the American Revolution, the Civil War, and World War II and appearances by important figures such as Betsy Ross and George Washington. The book also provides a list of rules for handling the flag, and the three situations in which the flag must be saluted. 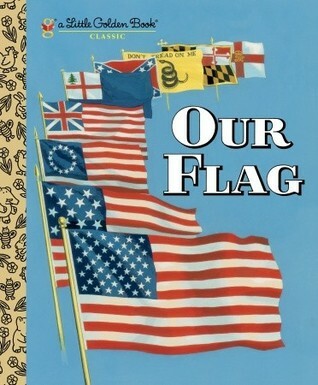 It's a great first introduction to American history (and patriotism) for preschool and kindergarten kids, and though it is from the 1960s, it's perfectly accurate and appropriate for a 21st century audience.